Ahh, so guess who is behind on their Goodreads reading challenge? I’ve been super busy in May, it was also my birthday and I had a couple of days off work so I’ve just been up to all sorts. I only managed to finish two books. I started reading Pilgrim State last week but didn’t manage to finish it before the end of May. I’m currently reading it now and I’m really enjoying it. It was a tad bit confusing in the beginning, but now that I’m in to it I really like it. I’m tagging it on to this month's reading list because I’ll finish it this month, obviously. So on to this month. I placed another Amazon order and selected some books that I’ve wanted to read for ages. Eat. Nourish. Glow. by Amelia Freer - I’m sure you’ve heard about this book everywhere. I actually remember hearing about it at the beginning of the year when Hachette ran some sort of 30 day marketing campaign, I even downloaded the free recipe that came with it. Next thing I know every blogger was talking about it. It wasn’t until I saw what the book was actually like in Mary from anothergirlslife vlog, that I decided I wanted it. It has quotes! Health quotes! I love quotes. I thought it was just another recipe book like Deliciously Ella, but this actually has information and quotes to help promote a healthy lifestyle. I’ve already started reading this and I’m enjoying it SO much. It’s so helpful and not at all patronising. Brick Lane by Monica Ali - This is a recent find for me. I found out about it from an article in on the Stylist website. It was to do with books set in London. I don’t actually think I’ve ever been to Brick Lane (I know, I know) but I read the blurb and thought that this actually sounded really interesting. I love books to do with young people moving to the UK, it’s so interesting to see how they possibly see things and just what London or the UK is like through their eyes. I loved Pigeon English, a book that has a similar setting to this. Dare Me by Megan Abbott - I think I found out about this book from one of the pages in the Stylist magazine. Truth be told I can’t remember why I wanted to read it, but it’s young adult and crime fiction story and I am partial to both of those genres so hopefully I enjoy it. Eats shoots and leaves: The Zero Tolerance Approach to Punctuation by Lynne Truss - This book is going to be more of something I dip in and out of. I write a lot of content on a daily basis and I obviously write for my blog, but truth be told my grammar and use of punctuation can be awful. So I’ve decided to address this. I’ve actually heard a lot about this book and I think the title and the blurb is so witty. I like that this book is supposed to go into why things are the way they are, as I know that how I remember something, when I know why it’s being done. So that’s my book list for this month. 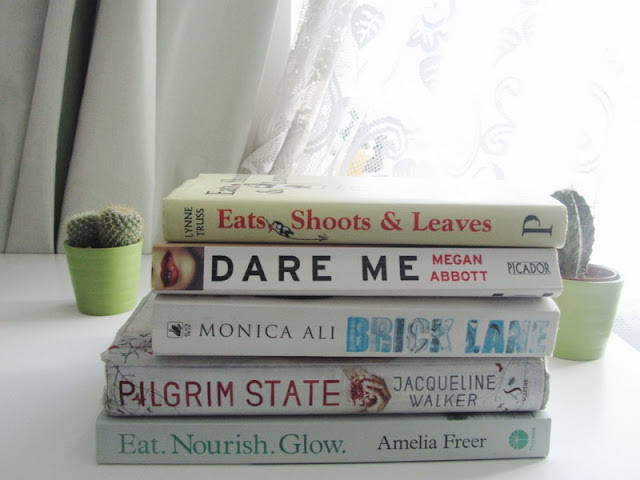 I only have one day booked off this month, so hopefully I’ll be able to get stuck into my reading list this month.